The Sunday Salon [8.21.11] – my books. my life. I like these Sunday Salons because I like “checking in” in a more informal way once a week, but sometimes I really don’t feel like I have much to say. Today is one of those days. I do feel like I found some focus again this week after a summer of distraction, although I don’t really have that much to show for it. 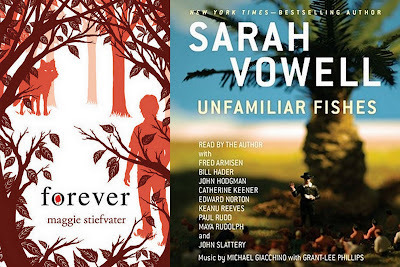 This week, I finished Unfamiliar Fishes on audio and finally got to Forever. And now I am reading Ink Exchange (I will finish today but I don’t think I will meet Ben’s challenge to me to start and finish TWO books this weekend). I am listening to Deadline (which I bought with my first Audible credit!). Anyone else finding their focus now that summer is coming to an end? I look forward to seeing what you have to say about Unfamiliar Fishes. I’ve been wondering if I should check that one out. Finding my focus is coming a little more slowly this year. I can’t even remember what time I used to get up in order to be out the door at 7:15 each morning! I guess I’ll have to figure it out soon since I am back to work/school tomorrow. I can’t wait to hear what you think of the Vowell. I enjoyed it and learned a lot. I also just bought Forever on Friday as well, and passed it straight to my daughter who was eying it the minute I got home! I hope that you have a great reading week, and that your focus comes back soon. I know what it’s like to be off track! Hope you enjoy Ink Exchange!